Reference this essay: Aceti, Lanfranco. 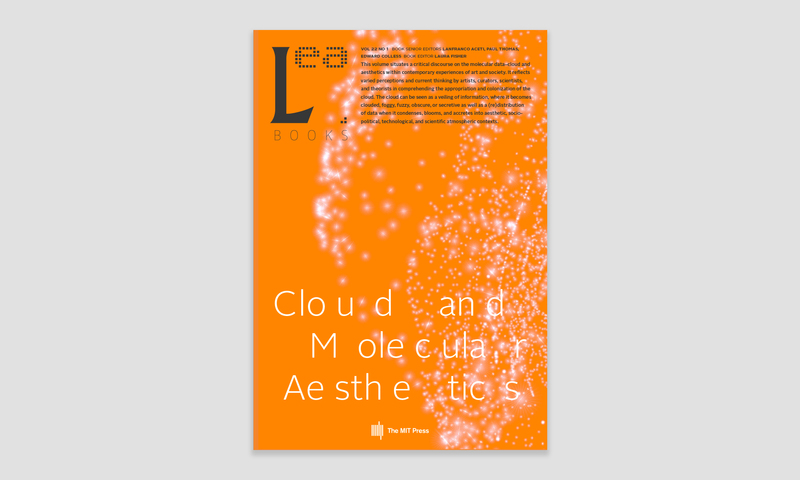 “Introduction to Cloud and Molecular Aesthetics: An Analysis of Individual Components in Larger Systems.” In Leonardo Electronic Almanac 22, no. 1, edited by Lanfranco Aceti, Paul Thomas, and Edward Colless. Cambridge, MA: LEA / MIT Press, 2017. Acknowledgment: The Leonardo Electronic Almanac is a collaborative effort supported by MIT Press, Leonardo/ISAST, Goldsmiths, KHM, New York University (Steinhardt School of Culture, Education and Human Development), OCR (Operational and Curatorial Research), and CAC (Contemporary Arts and Cultures). Cloud and Molecular Aesthetics, via a collection of essays, reflects upon the relationship between the small and the very large. Offering varied perspectives and conceptual approaches, this carefully curated collection analyzes the complexity of contemporary society specific to aesthetic endeavors that use scientific and digital frameworks as a means of relevant expression and critical examination. This volume—inspired by aesthetic intellectual paradigms and scientific interpretations of the words ‘cloud’ and ‘molecular’—presents conceptualizations that are not solely related and restricted to scientific and aesthetic endeavors but also to socio-political understandings of reality and its visual representation. In writing this introduction, my mind has gone back over and over again to the events that have taken place in Istanbul, and Turkey more generally, since days of that conference. As personal vicissitudes intertwine with larger schema, the observance and subsequent distraction of their movements as collective swarms of molecules, animals, or people allows us to all too easily discount or totally ignore the individual role each contributor plays. It is like observing a sky full of clouds within which we recognize the larger patterns but are somehow unwilling or unable to gain a deeper understanding of the singular minute parts and of the forces that affect them. The process of writing and recording, as well as my own work as Editor in Chief of the Leonardo Electronic Almanac, is rooted in a vision of historical documentation of these minute elements and their flux, which are aggregated in the form of editorial projects in order to cast a structure and present an interpretation of reality. This approach has led me to question the role of the artist as a single molecule in relation to the larger swarms, the even larger historical events, and the infinitely larger times of existence. I used to give a quote to my students in Istanbul, during my semester lectures in visual culture on the role of the artist and social engagement, that would point to and engage with a concept of the artist as the embodiment of these forces. Cloud and Molecular Aesthetics offers a view of these forces through a variety of perspectives on ethical, scientific, aesthetic, and social issues. The book is also a reflection of two small events: a conference and an exhibition. Within the larger scope and scale of various historical contexts, these events anticipated and embodied issues that would become both more apparent and complex as time passed, thus actively shaping perceptions into contemporary historical facts. This was a process that rendered visible, at least to my mind, the complicated intertwining of relationships and networks, as well as unveiled some of the visible and invisible forces which shape actions, decisions, thoughts, and, ultimately, aesthetic approaches. This is a time in which the processes of exploitation, the collapsing of empires, and the striking back of forces that have been unleashed by greed, self-interest, and lust for power allow human creative analyses to extrapolate meaning through metaphorical and allegorical paradigms. In this particular book, these paradigms are inspired by molecular, chemical, and cloud networks as a way of seeking harmony within chaos, beauty within horror, meaning within the meaningless. Somehow, when we created this call for a conference, which, in Istanbul, had its magical moments of collegial engagements, discussions, and hopes, I already knew that the unfolding of events was leading to complex international upheavals. It was for this reason that my own presentation and interventions focused on the attempt to unveil the allegorical nature of both the cloud and the molecular, beyond the representation of the individual as a small part of the whole. I have trouble concealing my surprise when I read this essay, which I began writing in 2014, and discover that it anticipated certain socio-political trends and disruptions. This essay also sought to re-imagine the way in which these unknown forces work through humanity, in order to uncover a framework that would allow one to gain an understanding of the role of the individual in the larger scale of events both plausible and implausible. The use of Anthony Wiener as an allegorical Dantean lonza  in “Wet Me” in response to Darren Tofts’ keynote, foreshadowed themes of post-postsociety and rather strangely anticipated the re-appearance of the ‘Wiener’ in the 2016 presidential elections of the United States of America. As if it were a sexual disease, never gotten rid of and always reappearing, Wiener symbolizes the sleaziness of elites incapable of reforming; always ready to control the sexual life of others while themselves engaging in those condemned actions as well as any other worst possible behaviors. The equality and diversity of the “universal presupposition”  of politics is actually coming apart; this assumption has faltered in the moment in which the divide between the community and “politics in its strict sense”  has undermined the idea of equality and enshrined, as part of politics in its strict sense, the idea of difference as conflictual divisiveness in the community. The impossibility of equality and the rise of difference is embedded within the community itself via forms of exploitation that have rendered the community alien from the statal institutions which are supposed to represent it and, simultaneously, different from that portion of the community that governs it, which has become so small to have rendered itself politically irrelevant. The masses, despite the attempt to financially buyout elections, can shake and have shaken institutional structures which were supposed to be eternal but have instead shown, both within the US and the EU, an institutional fragility directly proportional to the level of alienation of the masses of commodified and deprived individuals that constitute these nation states or supranational institutions. This is also the fragility of the elites exposed to the winds of a molecularly radioactive populism, a legitimized response to failed democracies transformed into oligarchies and verging on pre-dictatorships, which is now, depending on personal or collective ideological stances, either contaminating or cleansing the well. The legitimized response of a molecularly radioactive populism is a result of the expulsion of large strata of society from participation in the economic, social, and political life of the nation state or the supranational institutions and that self-legitimize their existence outside institutional processes and frameworks and via personal media engagements. Therefore, the contrast is between the failure of subjectivization and the radical objectification which has transformed the community into uncontrollable singular molecular citizens (or better said: postcitizens) no longer bound or related to the idea of the body politic—if not in opposition to it. The individual—no longer part of the people even when given the populist label—has been alienated from the community by a financial divide and a process of commodification. The process of alienation has afforded the individual the freedom to aggregate and disaggregate according to personal whims, trajectories, thoughts, and itches. The new molecular existence of the alienated individual with its cloud-like aggregations—imagined, real, or virtual—provides the opportunity for a new aesthetic reconsideration of society and of all those who operate within it. The problem of apportionment and the relationship between the parts to the whole is a fascinating aspect of this metaphorical molecular observation at an individual level in which, suddenly, radioactive and free to aggregate and disaggregate without bounds, bonds, and ideological restrictions, the individual is again the protagonist of events and histories. It is as if with the acquired freedom there is no longer a process of apportionment and a construction that requires an acknowledgment of self-evident facts positioned at the basis of “the distribution of the sensible,” as Jacques Ranciere states. If self-evident facts fail, because of post-truths or because of their inherent propagandistic nature as mouthpieces of the body politic, then the distribution of the sensible is no longer possible. There is no apportionment to be done because it is impossible to recognize the existence of something in common in the form of self-evident facts; what is self-evident and what is a fact for one side is not necessarily factual or self-evident for the other side. What also collapses is the possibility, without commonly shared facts that individuals and the body politic can agree upon, to delimit and partition roles, spaces, and times. The impotency of the participation of the individual, restricted from engaging within a democratic model, as well as the individual’s inability to take part in the distribution of resources, generates a landscape in which the cloud is no longer and the single molecule takes the form of water raining down as part of an entirely new status and new cycle. It is the role of the individual, in its various forms of engagement and disentanglement, at which Cloud and Molecular Aesthetics hints. This introduction provides a political context, disconnected perhaps from the scientific elements that compose its sections but nevertheless, as in Levi’s approach, are heavily influenced by it. The connection and disconnection of people, the apportioning and appropriation of parts, infinitesimally small though they may be, are framed in the construction of a personal narrative which, although invisible and inaudible, still exists with its inherent disruptive possibility of being uncovered and discovered. There is no longer need to follow Rancière’s approach to a collective subjectivization in order to be rendered visible. The opposite is actually possible, therefore betraying Michel Foucault, Gilles Deleuze, and Félix Guattari’s approaches, and stepping into a blessed objectivization which, by seeking invisibility, post-truth, disaggregation, chaos, and separation, offers the space for a new threatening identity. This is not the identity of the minority, classically conceived as neatly enclosed within its own operational ghetto delineated by the nation state and bent to the processes of subjectivization/subjugation enforced by the body politic. The identity is constructed as a forced revolutionary independence that is the imposed consequence of the carving out of the individual from the community, as an alienated and unrecognizable element, an objectivized individual ‘which’ was once part of the whole, but now is with nothing left to lose and to participate in, and therefore free to have or to be, or perhaps both. Paul Carey-Kent, “The Small Infinite,” Frieze, September 16, 2014, https://frieze.com/article/small-infinite (accessed January 14, 2017). Belinda Rathbone, Walker Evans: A Biography (New York: First Mariner Books, 2000), 285. Roald Hoffmann, “Molecular Beauty,” The Journal of Aesthetics and Art Criticism 48, no. 3 (Summer, 1990): 202. Sally Mussetter, “Dante’s Three Beasts and the Imago ‘Trinitatis’,” Dante Studies, with the Annual Report of the Dante Society 95 (1977): 39. Primo Levi, “Chemistry Lessons,” The Wilson Quarterly 13, no. 3 (Summer, 1989): 217. Jacques Ranciere, The Politics of Aesthetics, ed. and trans. Gabriel Rockhill (London: Bloomsbury Academic, 2013), xiii. Jacques Ranciere, The Politics of Aesthetics, ed. and trans. Gabriel Rockhill (London: Bloomsbury Academic, 2013), 7. Gerald Raunig, “Singers, Cynics, Molecular Mice: The Political Aesthetics of Contemporary Activism,” Theory, Culture & Society 31, no. 7 (2014): 69. Natasha V. Chang, “Chemical Contaminations: Allegory and Alterity in Primo Levi’s ‘Il sistema periodico’,” Italica 83, no. 3/4 (Fall – Winter, 2006): 543.